Elfin Cove history excerpts from a slide show written and compiled by Louise Mourant. Ernie Swanson was a visionary who saw the need for a community in Elfin Cove. He witnessed the fish camps the natives established each season. The fish were here and all else could be built to support this industry. He recruited different people with skills needed to develop a healthy community. Ernie had a large floathouse he used for his fox farm on Three Hill island which he brought to the cove to live on while he was buying salmon at what’s now called Mikes Island. In those days the fish had to be split and salted down (Mild-Curing) and packed in heavy wooden boxes which were made of planks 2' x 4' x 1' deep. These boxes were made out of 2" planks with rope handles in each end. These boxes soon became called totes as they were then loaded onto the "packer" which was simply a boat to haul them to the cannery. The boxes would be emptied and food stores brought back in them. Ernie had all the "ships stores" in his float house. 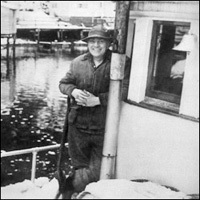 Ernie came to Alaska on a sailing vessel as a "cabin boy". To clean the bottom of these ships required a sandy beach to lay them on, fair weather and two tides to get both sides. Because of the combination, cleanings were erratic. He used to raise rutabagas at Glacier Bay; went broke, then tried fox farming on Three Hill. The main part of Cove Lodge (Next to Mourants) was originally another fox farm building, and was floated to the cove and winched up the beach to where it stands today. In 1942 Thelma (later to be Peterson) and Fred Folette (Louise Mourant's folks) came to the Cove for fishing. Bob and Louise Mourant came in 1957 to run the Oil Dock. Rose and Hazel had a sewing bee on top of the warehouse. Ruth Swanson had a bunch of wine they got into. Bessie was all dressed up (as usual). On her way home, she fell off the boardwalk and got muddy. When she walked in the house, Roy thought she'd been to a "smoker" rather than a "sewing party". Bessie Elliott was a "working woman" and Roy Elliott was her bouncer. Ernie was impressed with her energy & convinced them of the opportunities available here to get out of her line of work as she was a mature woman. There was a need for a restaurant in his new town. So the first cafe' was built on pilings between Patti's smoke house and the creek. A little shack was put up a little above the walk next to the creek and water from the creek was piped thru and this was Elliotts' meat storage. They operated this cafe' until the early 50s. Ruth Swanson had all the qualities Ernie needed in a woman. Ruth had been reared on the east coast with the advantages of the upper class but was considered an old maid for she was 30 yrs old and unmarried. Ruth was very tolerant of people and did well in the Cove. She arrived here the same year as Bessie and at that time they were the only two women around. A post office was established in 1935 with Ruth Swanson as Postmaster. She didn’t want it called "Gunk Hole". One morning as Ruth was sitting having her morning coffee and looking at the head of the cove she commented to Ernie how mystical the morning was: "With all the mist in the trees you can almost see little Elves dancing about." He agreed and Ruth said we should call it the Elfin Cove post office and so the village got its name.